William "Rhett" Lynn, our brave warrior, was welcomed into heaven's gates on April 4th, 2019. He passed away pain free in the loving arms of his parents. 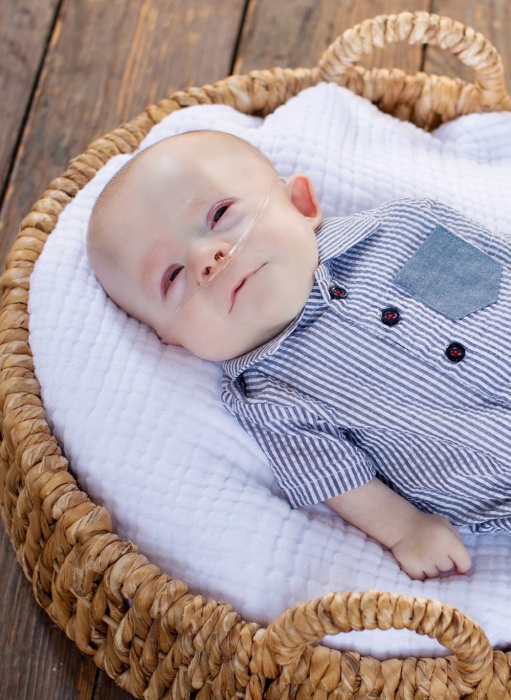 Rhett was born on December 2nd, 2017 with a rare, terminal genetic disorder called Rhizomelic Chondrodysplasia Punctata (RCDP). RCDP might have affected his physical body, but in no way limited his joyful, loving spirit that lit up everything surrounding him. He loved music, lights, bright colors, his fox wubbanub pacifiers, and being cuddled and loved by his adoring family. He forever changed the hearts and lives of those who knew him, and this world is a better place having had him in it. He was survived by his loving parents, Charles (Chase) and Ashley Lynn; his adoring brother, Elijah Lynn; Grandparents, Sharon and Edward Lynn; Great-Grandparents, Wanda Corley, Carole Massey, Lynn and Charles Lynn; Aunt and Uncle, Zachary and Stephanie Lynn; Cousins, Logan and Harper Lynn; As well as many other family members who loved him deeply and held him close in their hearts. In lieu of flowers, please make a donation online to The Children's Harbor and/or Rhizokids International. Visitation will be on Tuesday, April 9, 2019 from 1PM to 2 PM at Jefferson Memorial Funeral Home. Services will follow in the chapel at 2 PM and the burial will take place at Jefferson Memorial Gardens East.